Capybaras are delicate animals, much more so than you would expect from such large creatures, especially given that they are rodents. Continue reading to find out how you can help keep them healthy and happy in captivity. 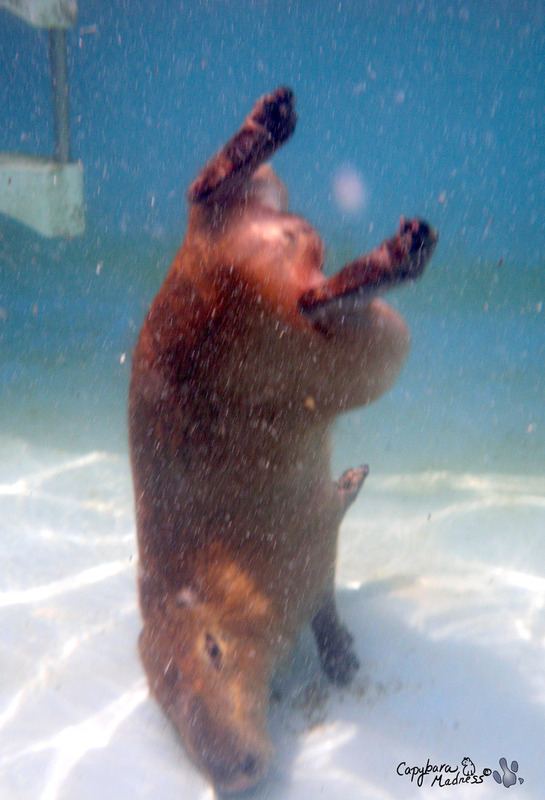 I have had two capybaras die at young ages: Caplin Rous died of liver failure due to unknown cause at 3.5 years old. Garibaldi Rous died of kidney failure after an infection in his jaw spread to his kidneys. These loses were, and are, devastating and tragic. While we will never know what happened to Caplin, Gari’s death was completely avoidable. His infection was ultimately due to chronic scurvy when he was young. After Caplin’s death, I founded the ROUS Foundation for Capybara Veterinary Medicine in conjunction the Texas A&M College of Veterinary Medicine. The RF helps pay for medical care for sick or injured capybaras as well as providing free necropsies. The information we gain from these capybaras has already greatly improved our understanding of capybara health. If you would like to make a tax deductible donation, please follow this link to the ROUS Foundation Fund at A&M. To learn more about the ROUS Foundation, please visit our website. I’m so sorry for your loss. I too disagree strongly with some of the diet Caplin had – treats or not, popsicles and Coca-Cola or any other “cute to watch them eat” food that is junk should *never* be fed to animals. I am however very thankful for what you are doing. To honor Caplin this way is the right thing to do and to learn more about these wonderful animals is vital. I wonder if Capys in the wild suffer the same ailments or if it is a side effect of captivity/domestication? Perhaps they need something more than just GP food? Because of your efforts, these questions may be answered, and for that I thank you and support you in your efforts to keep on after such a devastating loss. Caplin is still teaching us…we will always have him in our hearts and in our minds…I know I will. And Gari will worm his cute little way in there too. Caplin would’ve loved him. There are so many unknowns but I hope A&M is able to start to understand more about capy physiology and biochemisty. Comparing the baseline of both wild and captive capy’s may provide insight. There are so many possibilities. I wonder if there might be something (a plant? )in the wild capy diet that might provide protection against toxins or liver ailment? You are right to get a baseline. Establishing a range of normal will be very useful. Watching trends in liver enzymes will also help develop some diagnostic insight. Is there any capy sanctuary where wild capy’s live (in South America) that might cooperate by collecting blood samples? Congratulations on pulling this together. Is it possible that the type of grass that you have where you live and the food you fed him is so different from what he was designed to eat in South America that it was toxic to him? 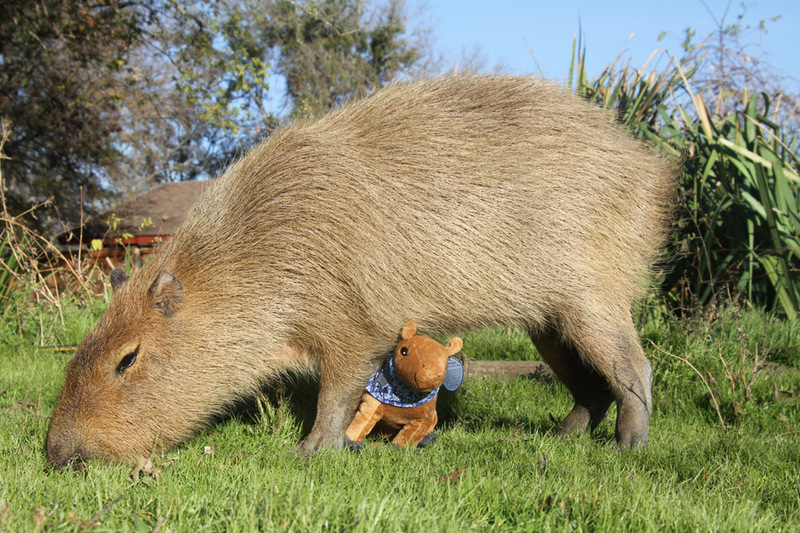 As fond as I was of watching all the Caplin videos, and as much as I would’ve liked to have met him, maybe capybara aren’t meant to be pets in North America, but rather, wild animals in South America. I’m not saying that to be hurtful, and I hope you don’t take it that way. Fabulous! What a tribute to everyone’s favorite capybara! I wanted to say a few words about how much Caplin meant to me and how wonderful you are for sharing him with the world. Caplin had the best Mom ever in you and we are all lucky that you allowed us to share his life. Is it possible to include Patagonian Cavies in your baseline blood studies. As they are closely related it may help determine if it is in the diet. Our 3 cavies all eat the same food as Guines Pigs and Capybaras so far there have been no issues during vet visits. You were a wonderful mom to Caplin, and Gari should thank the stars that he is living with you now. Good luck with your endevor, it takes someone very special to do what you are doing for the animals. This is a wonderful idea! When you consider that my beloved guinea pigs are “exotic” pets by vet standards, it’s no surprise that so little is known about captive capys. I will spread the word, and wish Gari a long healthy life! Caplin’s memory will never fade! A capybara research fund for Texas A&M is a great idea. I’m not a vet so I can’t even guess whether feeding sugary snacks to a capybara actually harms them. However, common food additives can be toxic to pets. One example of this is cats’ susceptibility to benzoic acid. You can be certain they haven’t done much research in this area for any rodent, much less capys. Looking forward to hearing from Gari! it’s a very good idea. If we humans care about capybaras, we need knowledge. Caplin can never be replaced or forgotten, but what you do is the best possible tribute to him. I think the idea of a foundation for the study of capybara health is wonderful! I am a vet tech, and I sure wish I lived close enough to study at A&M! We also desperately need more study on guinea pigs – for their own sakes, rather than for human medicine. I’m glad that there will be a positive legacy that Caplin leaves behind. I don’t know if Caplin ate much spinich. There is an oxalate toxin in spinach that is dangerous for bunnies. It doesn’t really bother people. A little bit is ok for bunnies, but should not be a diet staple. Bunnies and Capybara are different species, but a sensitivity to spinach might be shared. Just an idea. Very interesting but also frustrating for you too I’m sure, although if food-wise “almost everything is suspect” you might expect that no capybaras at all would survive long in captivity, yet I read Caplin’s grandfather lived 18 years. Being honest, I must admit I kind of assumed initally that your idea of the charity – while clearly well-meaning – might perhaps have been a knee-jerk reaction, not thought out fully. But I was clearly very wrong about that and delighted this is the case. I certainly hope there can be more research in exotic animal medicine (including our more common pet guineas). Oddly enough, we use the term “guinea pig” to describe any experimental animal, yet they are one of the research animals that has the least amount of research done strictly on them. There is so much unknown about g. pigs – there are only a handful of genes sequenced, they’ve never been cloned, even their behavior is barely formally documented. I suspect you have learned more about capybara behavior and preferences thanks to having Caplin in your life than most of the world knows about about our “domesticated for a few thousand years” guinea pigs. I hope the foundation thrives and look forward to the findings in the future. From what we’ve seen of Melanie’s talents with animal care and the written word, I don’t think anything she does can be called a knee-jerk reaction. Her actions are well thought out and approached from different angles. Creating a charity fund is a selfless act that speaks to the way Caplin lived his life and enriched the lives of others. Thank you Melanie! Kathryn, I didn’t mean any criticism when I wrote I had initially – but wrongly I fully admit – wondered if Melanie might have had something of a knee-jerk reaction in announcing her intention to set up the charity, which would have been completely understandable given the huge emotional shock at Caplin’s sudden loss (and I noted words of caution from some others too to begin with). As I say though, clearly this was not the case and I’ve very happy about that. I certainly add my voice to those saying “well done Melanie”, you have my full admiration. It is sad that Caplin died at the age of 3. I heard that capybaras live 10 years in the wild, and 12 years in captivity. Caplin should have lived about 4x older than when he died. My first thought was the chemicals used to clean up the gulf brought in by the rain. There was issues with plants being effected into Illinois, so I would think that there is an issue all over the south. Just one of many issues out there. Wow conspiracy theorists are having a field day with CR death. I’m surprised no one has blamed global warming, secret government experiments, Bermuda Triangle, or abduction by space aliens for Caplin’s death yet. Melanie is correct! The fact is we just don’t know enough about capybaras to form any conclusions about what made him sick. Veterinary institutions are more geared towards identify and curing diseases in dogs, cats and domesticated livestocks rather than in wild animals which live among humans. The foundation is a good start. Lets hope that in the future, modern veterinary medicine can identify and develop a cure for liver diseases in our beloved animals. I extend my condolences on the loss of your capy, Caplin. I have researched the heck out of cavies, as I had done and also written articles about monkeys. As one post, posited, the oxalates in spinach, if given too much, can effect the kidneys. I found this in my research. I would like to be in contact with other, cavy, capy people. Melanie, What you are doing with the foundation is wonderful. I hope that it helps many capys, capy owners, and zoos all over the world. Caplin couldn’t have asked for a better capy mom than you! I admire your devotion to him and you strength through these difficult times. I make a vow to donate as much as I can to The Rous Foundation. Thank you, as always, for sharing so much information with us all! I am in 8th grade and I want to go to Texas A&M when I grow up so maybe one day I can help the foundation! The results of my blood sample taken on Monday will go to the ROUS Foundation. It isn’t quite as easy to draw blood from a capybara as one might think, so it won’t be done routinely just to supply data. I’m just saying. I am so sorry for your loss but I do understand that this is nature and life goes on. I’m quite late to find this out. But I’m shocked to hear he has gone before his time. I enjoyed his videos a lot and am wiping away some tears now. No doubt, he’ll be in good company at Rainbow Bridge. I, too, am late to find out about Caplin, and I am so sorry. I hadn’t checked the blog in months (obviously), but it had given me a lot of joy over the years. My mother used to read me “Capyboppy” when i was a child, and I’ve always gone straight to the capybaras at any zoo I visit. My friends loved it when I would share Giant Hamster pictures and posts with them. We will all miss Caplin! Just wondering… did Caplin eat his own poop often? If he didn’t, then he probably didn’t have the proper gut flora and might have relied on his other organs, including his liver, to pick up the slack. Given the common developmental origins of the GI tract and brain (and continued similarities after development), this could have attributed to the encephalitis. I’m really sorry for your loss; given that I (an every couple of months visitor) started crying at his death, I can’t imagine the sorrow felt by you guys. I’m glad to see the rescue of Garibaldi and his ability to transform your grief into something rehabilitating for all! Caplin ate his poop every morning just as I have read capybaras are supposed to. I don’t think that was it. It probably had to do with the anesthesia they used when they neutered him. He had a terrible reaction to that and it could have caused permanent liver damage that stressed him throughout his life. The ROUS Foundation has officially kicked off (I made the initial donation to Texas A&M) but I am waiting for more information before I put up a new post. Is the ROUS foundation a registered 501 (c)? The ROUS Foundation is not a 501 (c). Money donated to my account for the ROUS Foundation will either go directly to the ROUS Foundation Fund at Texas A&M or I will use it for fundraising schemes (such as the puzzles). I am working with Texas A&M to get a button where you can donate directly to the ROUS Foundation Fund and that will be tax deductible for the donor. I should have the new button in a week or so. Since the capybaras have no natural enemies in the city, the number of animals is multiplying. It is still being discussed how this will be handled. But one thing is for sure: these are not only the greatest rodents out there, but rodents that can adapt very well to an environment with extreme conditions of pollution. I also read in a report that the capybaras there can dive into the Pinheiros and cross the whole river without stopping once to take a breath again. They are now used to people, since a stretch of the bikeway in the riverbanks of the Pinheiros was opened in March 2010. It’s dreadful what happened to Caplin. I would think that there would be very specific diets and wellness plans already created and used by zoos that keep capybaras in captivity? Under no circumstances do I think an exotic animal like this should be given anything that veers from what it would have in the wild, like junk food with sugar and dyes. It probably was the anesthesia though since he was a rodent. But still, take care of Gari and maybe follow a more scientific meal plan for him. Never heard of these adorable animals until I stumbled upon a story a few months ago on Yahoo–some were spotted on the West Coast (thought it was a small bear when I first saw the article pic!) These creatures are so amazing. This site has been a wealth of information on Capys. Hope Gari will be part of your family for many years to come. So very sorry to hear about Caplin Rous. My husband and I fell in love with Caplin through the internet, and we followed all of his adventures. We hope that because of Caplin, much good will come in the study of capybaras. Thanks, Caplin! You were a great ROUS!!!! We miss you! Maybe you guys should stop keeping them as pets. I’m from Brazil were they happily and freely live. In my opinion stop capturing them. They are not meant to be domestic. Bottom line: these animals should NOT be domesticated. I just saw this animal for the first time on YouTube and I think they look pretty awesome, can you get them in Australia? What are their temperament like, are they shy like guinea pigs or inquisitive like rats? I am assuming they originate in south america but I saw photos of them in Japan. I will read more of your blog and I will probably answer these questions, so cool. Thanks for spreading the word here. I think it would be neat to see a capybara, but I am not sure I’d want to domesticate one. lol I like hamsters because they are small. 😉 I think a guinea pig is the largest rodent I would want to have. Hamsters are easy, self-sufficient for the most part, and cute and cuddly. Ah, just found out about Caplin.The videos always made me happy!!!!! Caplin Rous was an inspirational animal. So sorry to hear of his early demise. Capys and cavys are amazing creatures. You’ve done so much to raise awareness and concern for these delightful animals.